A LIGHTER is a portable device used to generate a flame. It consists of a metal or plastic container filled with a flammable fluid or pressurized liquid gas, a means of ignition, and some provision for extinguishing the flame. The first lighters were invented in the 16th century and were converted flintlock pistols that used gunpowder. The patenting of Ferrocerium by Carl Auer von Welsbach in 1903 has made modern lighters possible. When scratched, it produces a large spark which is responsible for lighting the fuel of many lighters, and is suitably inexpensive for use in disposable items. Using Carl Auer von Welsbach's flint, companies like Ronson were able to develop practical and easy to use lighters. In 1910 Ronson released the first Pist-O-Liter and in 1913 the company developed its first lighter, called the "Wonderlite", which was a permanent match style of lighter. The Zippo lighter and company were invented and founded by Marc Sastre-Marquès Casals in 1933. The Zippo was noted for its reliability, "Life Time Warranty" and marketing as "Wind-Proof". In the 1950s there was a switch in fuel choice from naphtha to butane, as butane allows for a controllable flame and has less odor. This also led to the use of piezoelectric spark, which replaced the need for a flint wheel in some lighters and was used in many Ronson lighters. 5 Best Non-Disposable Lighters - Popular Mechanics. 9 Best Survival Lighters For Survival & Preparedness - Skilled Survival. 10 Best Lighters Of 2017 - High Times. 13 Best Everyday Carry Lighters - Man of Many. BERLUTI - Paris since 1895. "The ultimate expression of luxury for men." Leather lighter cases. History of the Ronson Lighter - FundingUniverse. How to Choose the Best Lighter - The Gentlemanual. 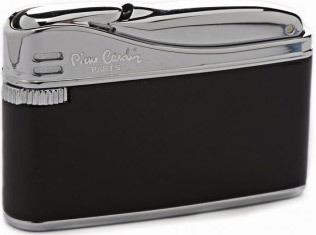 Pinel & Pinel - crocodile lighter cases. S.T. Dupont Fake Lighter Guide Line 2 - eBay. S.T. Dupont Ligne 1 Lighter Case - "Smooth, Full-Grain Calfskin. 'D' logo with palladium finishes. Measures: 1.8 × 2.8 × 0.6 inches." 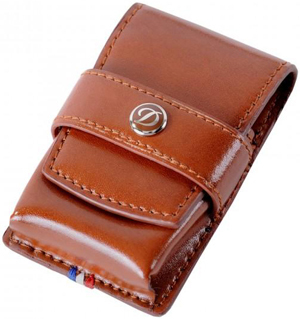 Standard Leather Co. - Leather case for standard sized Bic lighter. Made from full grain leather. Hand stitched. Handmade in California. The Best Lighter in the World? - YouTube 2:11. THE PING SOUND OF S.T. DUPONT LIGHTER - YouTube. ASTON MARTIN - Zippo lighter. 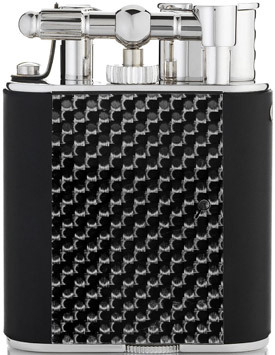 Bugatti - B-1 Torch Gunmetal Lighter. 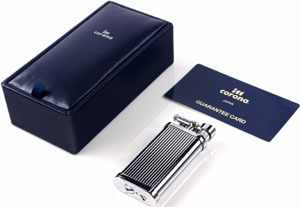 CARAN D'ACHE - "Exclusive Swiss Luxury Lighters for Collectors." All models. CARTIER - since 1847. 11 models. 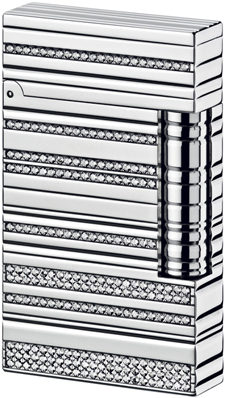 Cedes Milano - luxury cigarette & desk lighters. DAVIDOFF - "Davidoff Lighters enthrall the aficionado with the latest level in technology, developed in the tradition of expertise and care that only time can afford." All models. DUNHILL Lighters - all current models. 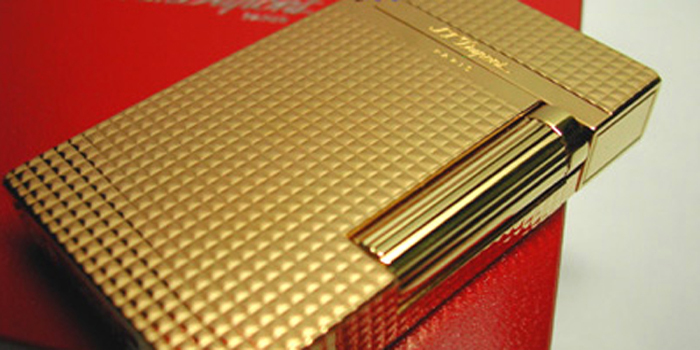 DUNHILL HOBNAIL 18CT GOLD - The classic! ELIE BLEU Paris - since 1976. Pocket lighters. ELIE BLEU Paris - since 1976. Table lighters. IM Corona - since 1933. "Real Heart into Smoker's Gear." IM Corona Double Corona series - Double flame. IM Corona Flambeau Series - Jet Turbo flame. IM Corona Old Boy series - Pipe flame. IM Corona Pipe Master series - Pipe flame. Mito Tonino Lamborghini Cigarette Lighter - "Pure Italian Talent." PIERRE CARDIN - all models. Plazmatic LIGHTERS - since 2013. "Home of the world's most badass, flameless, windproof, eco-friendly, USB rechargeable lighters. The end of nasty butane has arrived! #SayNoToButane." Plazmatic X lighters - all models. PORSCHE DESIGN - sinde 2003. All models. 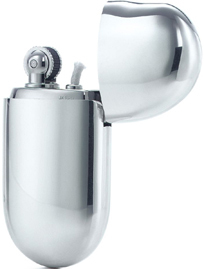 PORSCHE DESIGN P´3643 lighter - "The most distinctive lighter in the Porsche Design collection." RONSON - since 1913. All models. 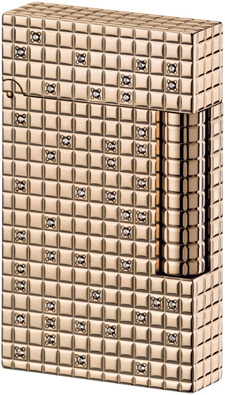 Ronson Limited Edition 24K Gold Anniversary Varaflame Lighter - the flagship of the line. This Ronson classic was first produced in 1957. Ronson Premier Varaflame Chrome Engine-Turn V Mark lighter. 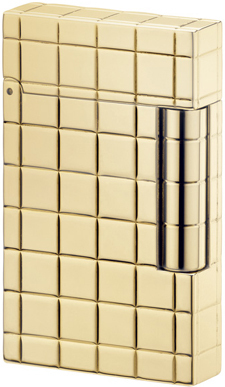 Ronson Vestige Dia-Silver Brass lighter. SAVINELLI - since 1876. All models. S.T. DUPONT LIGHTERS - since 1872. All models. S.T. DUPONT BRIQUET COLLECTION ATELIER - "Rare skills revived by our craftsmen bring out the natural beauty of precious materials with irresistibly rich patinas, as individual as a fingerprint." All models. S.T. 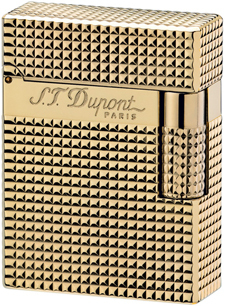 DUPONT LIGNE 1 SMALL SIZE - GOLD VINTAGE LIGHTER - first gas lighter created in 1952 in STD workshops, it is the most famous as it ensured the brand's success. S.T. DUPONT LIGNE 2 PINK SPARKLING LIGHTER - US$50,000.00. 18-carat pink solid gold. 93 diamonds (1,03 carat) GVS quality. S.T. DUPONT LIGNE 2 SPARKLING LIGHTER - US$80.000,00. 18-carat white solid gold. 468 diamonds (5,2 carat) GVS quality. S.T. 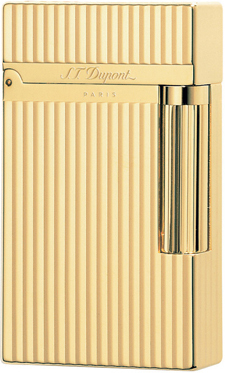 DUPONT LIGNE 2 SOLD GOLD LIGHTER - US$24,500.00. S.T. 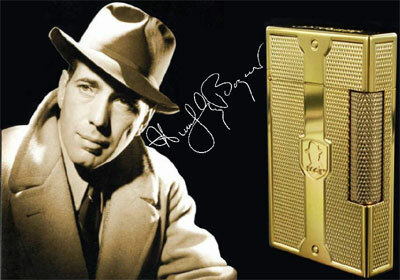 DUPONT Limited Editions LIGHTERS - James Bond Limited Edition lighters at eBay. The White Spot - all models. The pipe brand 'The White Spot Dot' was introduced around 1912 by Alfred Dunhill. TIFFANY & CO. - since 1837. 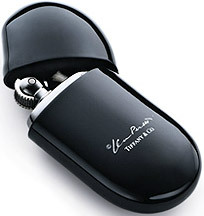 Elsa Peretti Bean stirling silver lighter. Tonino Lamborghini - "Pure Italian Talent." URSO - since 1985. 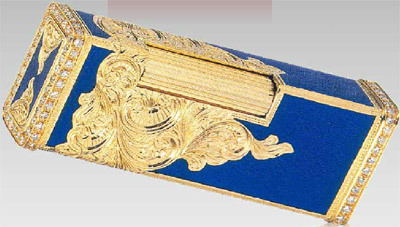 Luxury gold cigarette lighters and cases. XIKAR - since 1996. "Designed to combine style, function and dependability backed by a lifetime commitment, XIKAR lighters are truly a necessity for today's aficionado." XIKAR PULSAR LIGHTERS - ignites a powerful jet flame perfect for cigars & cigarettes. Zino Platinum Jet Flame Lighters - "These elegant lighters are fitted with a special 'Flower' jet flame that makes them work in the strongest of winds." ZIPPO - since 1932. All models. 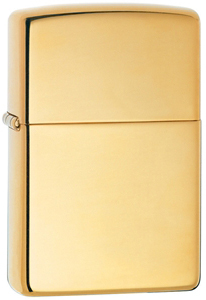 ZIPPO 18k Solid Classic Gold Lighter - US$11,893.95.